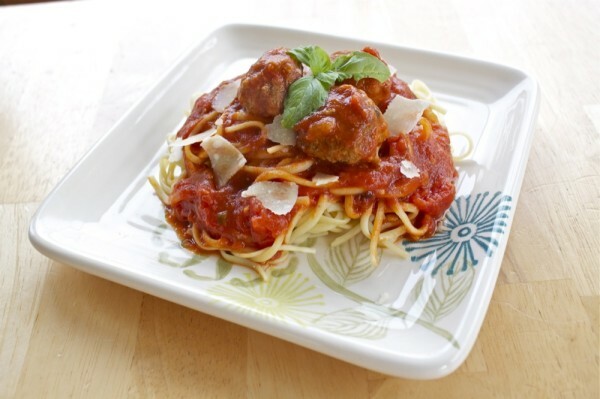 This Easy Homemade Spaghetti and Meatballs recipe is not only a family favorite and a regular in our dinner rotation, but it is also one the recipes on the site that I am most proud of. I hope you enjoy it as much as we do! 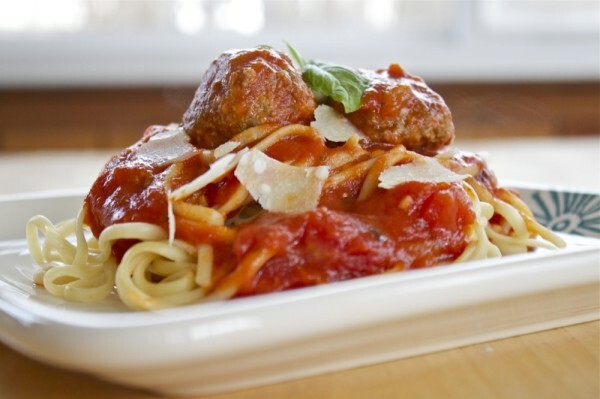 My favorite meal has always been spaghetti and meatballs. When I was young my favorite was Ragu. Not Prego. No chunks of anything, either. My tastes have changed a bit as I’ve grown older, thank goodness! Now I make the sauce myself…kind of. I don’t usually have access to fresh tomatoes good enough to cook down into my own sauce, so I cheat and used canned. It’s not exactly “homemade”, but I can control the ingredients, flavor, and accents much better than buying jarred sauce. 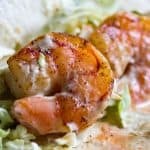 I have a BUNCH of recipes on the site that are a variation of this. 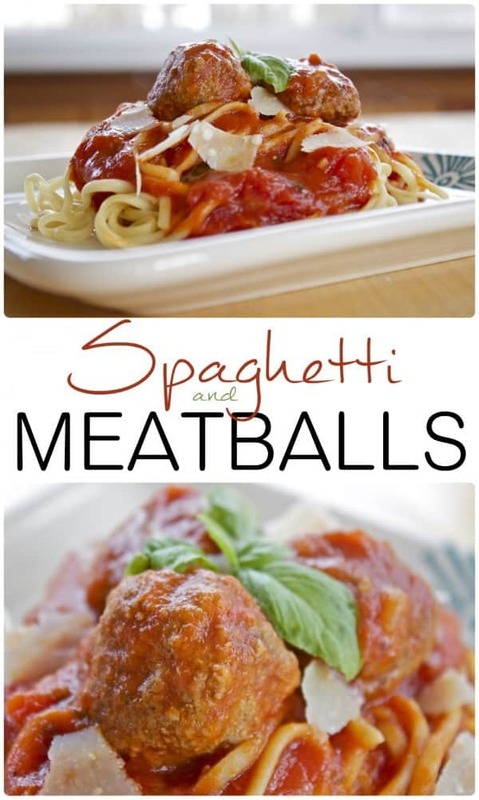 Spaghetti and Meat Sauce & Herbed Marinara for an example! 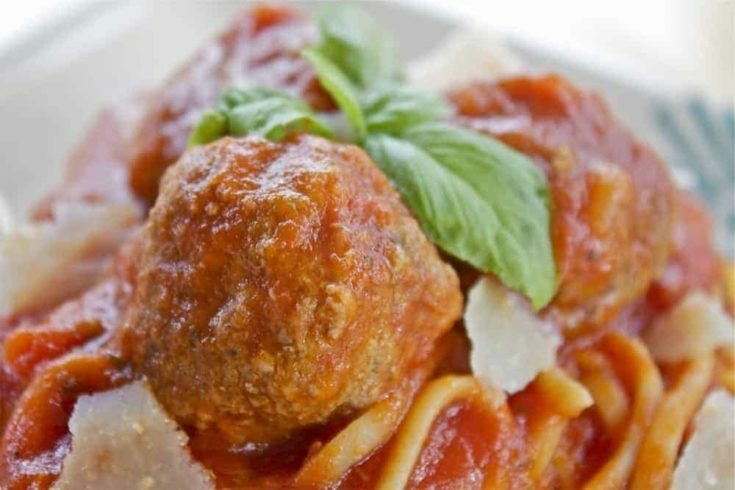 My favorite way to make this sauce though is with good homemade meatballs! What kind of tomato sauce should I use for marinara? 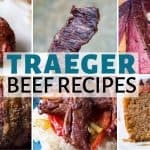 You can use whatever brand of sauce and tomatoes that you want, but you’ll discover different brands lend very different flavors to the end result. 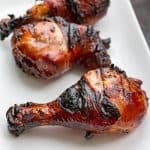 Experiment and find your favorite, but be aware that the amount of seasonings you will need can vary greatly if you don’t use the same base ingredients that I am using. 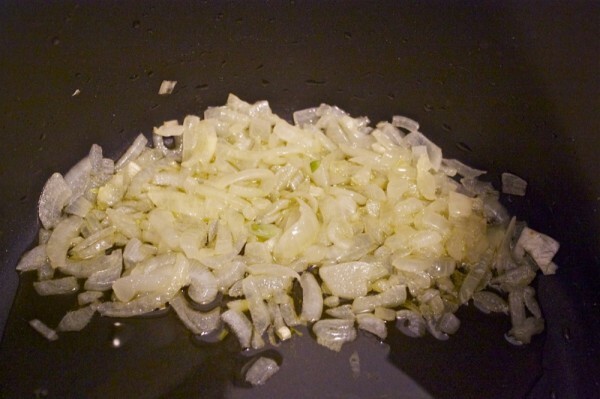 Start by sautéing some thinly sliced and chopped onion in olive oil over medium-low heat. While the onions are cooking, start your meatballs. Stir the onions frequently and cook until translucent. Take one slice of whole wheat bread and pour enough milk over it on a plate to thoroughly soak it. Squeeze the excess milk lightly from the bread, and tear into small chunks. Place into a bowl. 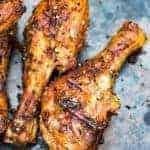 Use 1 large egg, 1-2 TBSP chopped garlic, 2 tsp garlic salt, 2 TBSP super-finely chopped onions, ½ tsp basil, ½ tsp oregano, and a few shakes of ground black pepper. Mix all of this together well, either with a fork or with your hands. 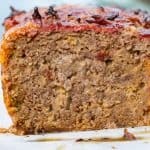 Make sure the bread is mixed well and there are no chunks of it in the meat. 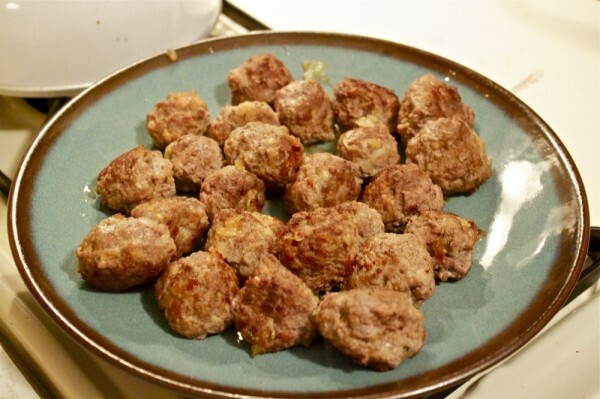 Form into small meatballs, approximately 1 inch in diameter. You can make them bigger if you prefer, but I find that they fall apart more easily if they are bigger, and they take much longer to cook through. Brown the meatballs in the same pot you are cooking the onion in. Scoot the onion over to one side of the pan and stir now and then to make sure they don’t burn. 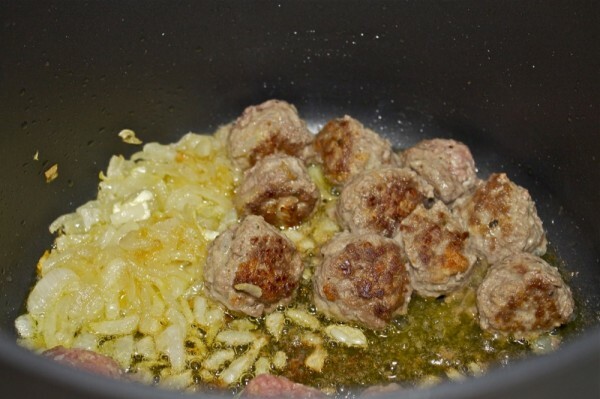 After all the meatballs have been browned, remove from the pan leaving the onion behind. Add to pan 2 TBSP of chopped garlic and cook for 1 minute. Add 1 28 oz can of Dei Fratelli All-Purpose Italian Sauce, 1 – 28oz can of Dei Fratelli Tomato Sauce, and 1 14.5 or 15oz can of your favorite diced tomatoes. 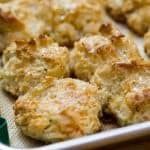 Add in ½ tsp cayenne pepper, 2 tbsp of chopped fresh basil (or substitute 2 tsp dried basil), ½ tsp oregano, and 1-2 cups of water. 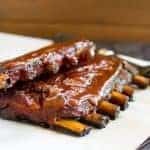 You want the sauce to have something to cook off so it’s not too thick in the end. Let this mixture simmer for approximately 20 minutes. 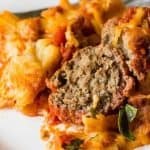 Add in the meatballs, stir gently on a regular basis, and cook an additional 30 minutes to 1 hour, or until meatballs are cooked through. Top with a high-quality parmesan, and serve with your favorite pasta, caesar salad, and fresh garlic bread. 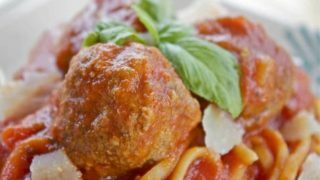 This easy spaghetti and meatballs recipe is made from scratch and is one of our favorite meals, ever! Heat onion & olive oil in large sauce pan over medium-low heat, and saute until translucent. Reduce heat to low. Soak whole wheat bread with milk and squeeze out excess. Tear into small chunks and put into a mixing bowl with egg, garlic, garlic salt, onion, dried basil, dried oregano, and black pepper. 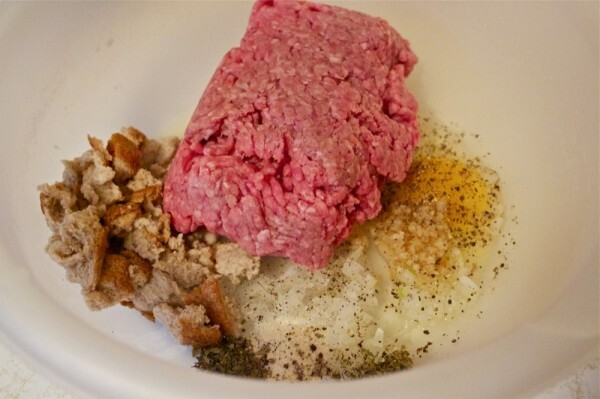 Mix well until bread and seasonings are well combined with meat. Form into small 1 inch in diameter balls. Turn heat in sauce pan up to medium and brown meat balls. Remove from pan when brown and set aside. Add 2 TBSP chopped garlic to sauce pan and saute approximately 1 minute. Add all other sauce ingredients except water, and heat to a simmer. 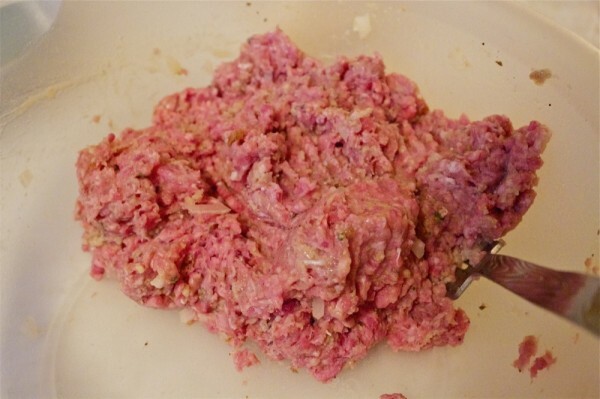 Return meat balls to pan, reduce heat to low, and simmer on low stirring frequently until meat balls are cooked through and sauce is your desired thickness. Enjoy with fresh grated parmesan, hot pasta, fresh garlic bread, and caesar salad.